Werner Herzog’s first feature film, shot in black and white in 1968, deals with themes that were to reoccur throughout his later works. Signs of Life is set during World War II. 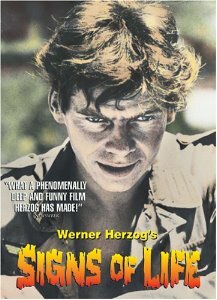 Stroszek (Peter Brogle) is a German soldier who is severely wounded in an attack by partisans on the island of Crete. To give him a chance to recuperate, his officers transfer him to the small island of Kos. There he is stationed at a Venetian fort that was built in the fourteenth century, where an ammunition dump is now kept. It is on a hill overlooking a town below. He is accompanied by his Greek wife, Nora (Athina Zacharopoulou) and by two other solders, Meinhard (Wolfgang Reichmann) and Becker (Wolfgang von Ungern-Sternberg). Meinhard is obsessed with killing cockroashes, while Becker is fascinated by the ancient Greek tablets that the Venetians embedded along with the stones in the fort’s walls. They find various ways to try to deal with the heat, isolation, and boredom of the place, such as building fireworks. A recurring theme in Herzo’s films is the world’s indifference to the fate of the individual. In an early scene in Signs of Life, the camera moves through a narrow winding street on Crete. It suddenly comes out on a broad street running along the ocean. We see people moving around in the far distance. The camera suddenly pans over to two dead German soldiers lying on the ground, presumably killed by partisans. After a moment, the camera pans back to the scene in the distance and lingers on it. The deaths of these two men mean nothing to the world at large. In one scene, a gypsy gives Stroszek a small wooden owl figurine. Its eyes and ears move. Determined to find out how this is possible, Stroszek finds that there is a fly trapped inside the figurine. This foreshadows Storszek’s won fate. After he rebels, we only see Stroszek in long shots. He looks like an insect while making his way around the huge fortress. He is trapped like the fly in the figurine. His attempt to liberate himself from the boredom and routine of his life has only puts him in another kind of prison. Herzog’s grim fatalism doesn’t offer us much hope, but the breadth and originality of his work make him one of the greatest filmmakers of our time.